Perhaps because it was built in secret and designed to be invisible, the stealth bomber is unforgettable the moment you see it. What few remember, though, is that the iconic silhouette almost looked like this. Here's the story of how Senior Peg came to be, why we didn't get it, and why we might want it back. Some aircraft are so notorious that they require no introduction — the P-51 Mustang and F-14 Tomcat are as much a part of pop culture as they are a part of military history. Yet there is one aircraft that is so identifiable and so intimidating that once you see it for the first time two simple words are forever etched in your mind: STEALTH BOMBER. It is the most expensive and complex intra-atmospheric flying machine ever built. This big boomerang of death and destruction remains so futuristic looking that it is almost impossible to believe that it has been invisibly prowling the world's skies for two and a half decades. The unique and downright breathtaking shape of B-2 is such a common fixture on the walls of grade school boys across the country that it is hard to imagine that America's beloved "stealth bomber" could have been any different than the one we have come to respect and our enemies have come to fear. Yet the truth is that the USAF's bat winged masterpiece could have had a stubby tail, a faceted windscreen and a Lockheed Skunk Works logo on the control yoke..
Stealth technology slithered from near-obscurity to the dark shadows of America's top secret aircraft design houses in the mid 1970's. A small but growing group within the Pentagon's Advanced Research Projects Agency wanted to explore the possibility of building a tactical aircraft that appeared as close to invisible as possible on radar. This initiative gelled into the eXperimental Survivable Tactical (XST) competition, which would lay down the stealth gauntlet to America's top military aircraft designers. The goal was simple, design a tactical aircraft concept that could all but disappear on radar, a tall order during a time when even predicting the radar reflectivity of basic shapes was challenging. In the end, Lockheed's Skunk Works "bleeding-edge" boutique design house was pitted against legendary aircraft manufacturer the Northrop Corporation. The rest is history, and like the Advanced Tactical Bomber program's story, the loser of that competition may have lost simply because their concept was too far ahead of their time. For more background before continuing, click here to read about the outcome of the XST competition, and how it would change aviation and world history forever. By the later part of the 1970's the Skunk Works team was riding high after winning the XST competition, and was in the process of testing their resultant "Have Blue" flying technology demonstrator, the arrow shaped aircraft that was based directly of their game-changing "hopeless diamond" computer model. Eventually the success of the "Have Blue" aircraft would morph into the F-117A Nighthawk Stealth Fighter, but there was one more major decision that the USAF would have to make before locking down the final design. There were two "Advanced Tactical Aircraft" (ATA) proposals that the Skunk Works put forth to the USAF after winning the ATX competition and testing "Have Blue." The "ATA-A" was a fighter sized aircraft with a 450-mile combat radius, one pilot, and a payload of around 5,000lbs. The "ATA-B" was a larger, "regional bomber" that sported a 1150 mile combat radius, carried two crew members, and 10,000lbs of precision guided weapons. The ATA-B was even pitched by the Skunk Works to be a potential replacement for the service's F-111 Aardvark swing wing medium bombers. In the end the USAF chose the least expensive and lower risk of the two options, the smaller ATA-A, as they wanted to be able to purchase enough of the jets on the black budget to make the program worthwhile. The result of this key decision was the F-117A "Nighthawk" as we know it today. 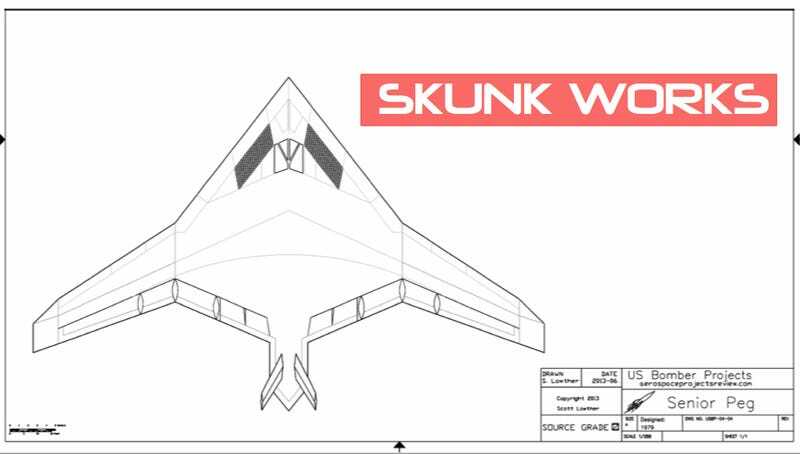 The creative and agile Skunk Works management team, headed by legendary aircraft designer and the grandfather of stealth design, Ben Rich, soon went back to the USAF, in this case the Strategic Air Command, and pitched a tweaked version of their larger ATA-B stealth attack jet to them. The USAF, and the Carter Administration who had controversially cancelled the B-1A program in part due to the aforementioned developments in stealth technology, had the same idea as Ben Rich. In fact the Carter Administration, a big believer in stealth technology's promise very early on, took a lot of heat for canceling the troubled B-1A and could not even explain to the press that they were going to focus on a new breakthrough game changing technology, that being stealth, as it was so deeply classified at the time. After a consensus was a made that a stealth bomber was strategically relevant and that is was actually possible to build one, the momentum for the program almost immediately began to build steam. To the Skunk Works surprise, the USAF did not want something to replace the F-111, they wanted something to replace the recently sacked B-1A, and even the 1950's vintage B-52. They wanted a big, long range, hard hitting, heavy bomber… And they wanted it to be as invisible to radar as the diminutive "Have Blue." It was a new decade, and as the program that would become the Advanced Technology Bomber (ATB) moved on, two competitors emerged as the finalists for another winner take all stealth jet competition. The same arch rivals who competed for the XST program, Northrop and Lockheed's Skunk Works, would be facing off again, and this time around the stakes were huge, both physically and economically. The USAF wanted 132 stealth bombers in a production run that could last almost 20 years. Both competitors knew that whoever won this competition could theoretically "own" the USAF's heavy bomber portfolio from about 1990 well into the next millennia, and perhaps forever. With the sheer size of aircraft and the numbers that the USAF was demanding in mind, both teams paired with another manufacturer for production. Skunk Works teamed up with Rockwell, who had just lost the B-1A program, and Northrop teamed up with Boeing. The Northrop Corporation was still smarting from Lockheed's winning the XST competition, which allowed them to be "first to the plate" with a production stealth combat jet, the F-117A. Additionally, Northrop's ability to design low signature aircraft had taken a quantum leap in the half-decade or so since the XST competition. Aided by computer modeling and further research, Northrop fielded one of the most incredible, and misunderstood aircraft of all time, the Battlefield Surveillance Aircraft eXperimental (BSAX), otherwise known as "Tacit Blue." This experimental and stealthy "alien school bus" with wings would prove technologies that we are only seeing come to operational fruition in the white world today, some 30 years after its first flight. Click here to read the story of Tacit Blue, and how it was the grandfather of the now infamous RQ-170 Sentinel that spied on Bin Laden and later crash landed right into the Iranians hands. On the other side of the Advanced Technical Bomber boxing ring was Lockheed's Skunk Works, which had much more experience than Northrop in actually putting a stealth aircraft into production and working out the oddities surrounding a stealthy operational aircraft. Concepts and one-off demonstrators were one thing, building a low observable aircraft that could be economically fielded, flown and maintained in mass was an entirely different expertise altogether. The requirements for new super bomber were outright impressive. The aircraft had to possess a 6,000 mile unrefueled range and a weapons load approaching twenty tons. Although extremely low radar reflectivity was paramount, other signature reduction measures, such as masking the aircraft's infra-red footprint, had to be designed into the airframe as well. These unique requirements, paired with the computer processing power at the time, and the realities of plain old physics, led the teams to venture down similar design paths. In fact, during the design phase of the program a DoD official involved with the Pentagon's ATB project office saw a model of Lockheed's concept while at the Skunk Works plant in Burbank, CA and asked how they got their hands on Northrop's design! The combination of the long range, heavy payload and low observability requirements ended up funneling both teams' design processes into a similar space. This is also an eye opening indication of just how challenging designing an aircraft with these capabilities and aerodynamic demands truly was at the time. Regardless of similarities, each aircraft was actually quite unique. Lockheed's design was code named "Senior Peg" and Northrop's design was code named "Senior Ice." Senior Peg was clearly a Skunk Works product of the time period, with many features of the F-117A scaled up and blended into a flying wing-like planform. Faceted cockpit windows, and a highly raked frontal fascia with flat upper fuselage segments and mesh covered engine inlets were present. The wings of the aircraft resembled modern unmanned combat air vehicles (UCAVs) of today, with less sweep then the aircraft's forward fuselage. Yet the most unique thing about Lockheed's flying wing design was that it had a small "V" tail mounted on a short boom that emerged from the back of the fuselage. The concept looked strange to say the least, but it reflected Lockheed's design strategy, to make the aircraft as cheaply and small as possible while still meeting the program's minimum design requirements. In other words, Lockheed thought that the USAF would opt for a numerical advantage over excess capability, as the team had observed such a choice after presenting the ATA-A and ATA-B to the USAF a few years back. Meanwhile, the Northrop team continued with their ever-improving understanding of continuous curvature stealth design and decided to build a giant and exotic flying wing, something that Jack Northrop, the founder of the company, had been infatuated with to detrimental ends for almost a half century. Some say that when the Northrop management team showed Jack, who was in poor health by the turn of the decade, the model of their stealth bomber design, he cried with joy. The flying wing was truly Jack Northrop's "white whale," and modern computing power had finally caught up with the flying wing's super-efficient, but somewhat unstable design. Fly-by-wire control systems, where a computer interprets the pilots commands and then tells the control surfaces what to do in order to provide the requested result, all the while keeping the inherently unstable aircraft pointed in the right direction, would allow for the stability issues associated with such designs to be nullified. The Northrop Company's giant flying wing was code named "Senior Ice" and the concept offered excess payload and range well above the program's minimum requirements. Additionally, because the aircraft was larger and its control surfaces had much more surface area, Northrop's design was a true flying wing, allowing it to dispense with any sort of vertical tail at all. Split "elevons" on the wings, along with differential power settings according to some reports, allow Northrop's design to compensate for reduced directional stability and yaw control due to the lack of a tail. The Northrop team, energized by the possibility of making good on the founder of their company's greatest wish, was determined not to lose again to Lockheed. The competition between the two companies consisted of documentation that described their design's theoretical capabilities in detail, a series of wind tunnel tests, and it ended in May of 1981 in a "pole off," just like during the XST program, where scale models of both designs were tested against radar emissions at multiple band widths and from multiple aspects. Some say a flight test also occurred of at least one technology demonstrator from one of the companies involved. There has even been odd slipups amongst those who were involved with the ATB project who mentioned testing in the air as well as the ground, although this has never been proven. Both teams walked away very proud of their designs, but the contest was clearly closer than the XST competition years before. Then the results were released. Underdog Northrop was selected to produce the Advanced Technology Bomber. Lockheed was floored by this as they thought they beat them hands down in radar testing and their design was cheaper and less risky having leveraged lessons learned during the then budding F-117 program. Northrop disagreed with Lockheed's complaints, with management saying that they (Northrop) dominated Lockheed not just for radar cross section (RCS) testing but also in performance and overall capability. The tailless Northrop design was more efficient, with claims of 5-10% better aerodynamic performance, and their rounded solution for reducing radar reflectivity, born in the XST program and refined with "Tacit Blue," was seen as more effective against multiple bandwidths of radar emissions, not just the ones that are the most threatening historically. Additionally, this "broadband" stealth capability, although less effective than a tailor made aircraft specifically configured to defeat certain radar bands from certain angles, was thought to be more resistant to potential future enemy radar capabilities aimed at spotting stealth aircraft. Northrop also had an advantage over Lockheed when it came to sensor integration for their design. Tacit Blue was basically a nearly invisible flying radar surveillance platform. Northrop had made great strides not only in making the aircraft hard to detect, but also making Tacit Blue's radar emissions near-undetectable. This was a major advantage considering the ATB would be fielded with hugely powerful radar arrays for targeting. Stealth is worthless if your radar emissions give your position, or even your presence away. Metaphorically it would be like being invisible in the middle of a football game while screaming at the top of your lungs. You may be a little harder to find but with all those alert people on the field it won't take long till someone hears you. Finally, Northrop's flying wing was a larger aircraft than Lockheed's, with more range and payload, but it was also expensive. Very expensive. Lockheed's estimate to put "Senior Peg" into production was $200 million a copy, a number Ben Rich's Skunk Works team was very confident with after bringing the F-117 into production. Northrop's bid was about double that figure. Yet this was during the dawn of the Reagan era, where defense spending was about to super-nova. During this time of great investment into the US military, the DoD was no longer interested in the "affordable" solution, they wanted excess capability, even at great cost. Thus, Northrop would proceed on to produce the B-2 bomber as we know it today. Looking back, it is hard to say if the USAF's decision was the right one. The B-2 is an American treasure, but there are only twenty of the aircraft in inventory, of which the majority are either in maintenance, sitting nuclear alert, or providing testing duties at any given time. This abysmal number came from a cocktail of factors. The Air Force added the low level penetration requirement to the ATB program, resulting in added complexity and weight to the B-2 design. This also dropped the aircraft's intended ceiling of around 60,000 feet down to below 50,000 feet. Additionally, the Reagan Administration came through on their campaign promise and put the B-1 into production in a slower, but stealthier guise as B-1B, so there was not a pressing need for the ATB immediately and funds that could have gone into the ATB went to the readily available B-1B. Then there was Northrop's inexperience in producing a stealth aircraft in mass. The jet was the most complex aircraft ever built, with thousands of parts that were uncommon with any aircraft that came before it. Over 3500 subcontractors were providing components to Northrop for the program, which also increased the logistical complexity of the production line. As setbacks mounted, the B-2's unit cost climbed. This, combined with the fact that B-1B production was sucking USAF funds at an alarming rate, and there were clear signs that the Cold War may be thawing, led Congress to cut the B-2 buy to 75 units. This sent the bombers unit cost skyrocketing towards one billion dollars a copy. By the time the Cold War came to an end, and the "peace dividend" was all the rage, the final B-2 production number allotted by Congress was a measly 21 examples. This left the B-2's price tag at a whopping $2.2B each. This is almost the entire cost of building the Wynn Resort in Las Vegas! Fast forward to today and America is badly in need of a new heavy "stealth" weapons platform. With the strategic focus moving from the Middle East to the Pacific theater, a place where distance can be an enemy itself, and China becoming ever more belligerent in the region, the USAF has finally prioritized its hunt for a new multi-role long range stealth aircraft. This semi-secret program has gone through many names like its predecessors. Originally called the 2018 Bomber, then the Next Generation Bomber, and now the Long Range Strike Bomber (LRS-B), this aircraft will do much more than strike missions alone. The LRS-B is envisioned as being able to provide deep strike, penetrating and standoff reconnaissance, electronic intelligence gathering, network and communications conveyance, standoff attack, nuclear deterrence and possibly jamming duties. If USAF builds this program right, different versions of the LRS-B could potentially do other things as well. In many ways the LRS-B has become a canvas for the USAF brass to paint their wildest dreams upon, and this includes a push to make these advanced aircraft "optionally manned" and even relatively affordable. What is most interesting when it comes to the LRS-B initiative is that the physical requirements for the aircraft are said to be more like Lockheed's Senior Peg then Northrop's B-2A Spirit. For instance, the LRS-B will be smaller than the B-2 and it will represent lower risk than the B-2 did decades ago. Additionally, the LRS-B is said to have a smaller weapons payload, around 30,000lbs compared to the B-2's 50,000lbs. The jet will also have about 20% less range, and will utilize more off the shelf components than the B-2 ever did. Additionally, its design will be modular so that different capabilities can be fitted for different missions and upgrades later in its service like will be less costly. In other words, the USAF is trying buy their new bomber on a minimal requirements basis in order to get the total production run up and thus the unit price down. The is exactly what Lockheed's Skunk Works prioritized in their Senior Peg concept, a gamble that lost them the rights to build the LRS-B's predecessor. With all this in mind, one really has to ask the question: Did the USAF make the right decision some thirty plus years ago when it bought Northrop's stealth bomber instead of the Skunk Works' model? Would we still only have 20 stealth bombers (one was lost in a crash while on tour in Guam a few years ago) if the USAF selected the less risky and much less expensive, albeit less visually striking, Senior Peg? Would we really even need an LRS-B at this time if we actually had a much larger fleet of ATBs? Often times when one views these large weapon system competitions in retrospect, the loser looks much more enticing than the winner just on original concept alone, not on conjecture. Although the B-2 is a marvelous machine, actually it should be considered a national treasure due to its scarcity and its unique ability to put our enemies at risk anywhere and at any time around the globe, but it may have been a frivolous choice in retrospect considering we are now requesting the same basic specs and affordability out of our new bomber that the Skunk Works offered decades ago. Like the YF-23 that came a decade after Senior Peg was relegated to the very bottom of ash heap of military and aviation history, we can only look back and wonder what could have been. Although we have the crystal ball of time on our side, it is sad that our forces have paid for these retrospectively questionable procurement decision for decades after they are made. Would we be better off today with an F-23A, a super fighter that had longer range, higher sustained super-cruise speed and a smaller radar cross section, but less maneuverability and "prototype maturity" than the F-22A? I would say absolutely. Would we be better off today with a more numerous inventory of ATBs, albeit ones that feature slightly less range and payload capacity? Undoubtedly.